Historians debate to what extent the Treaty of Versailles was responsible for Hitler’s march to World War II, but there can be little doubt that the treaty ending the “War to End All Wars” continues to be a major factor in our “War Without End." On November, 11, 1918, Europe laid exhausted and nearly bled dry. Just months before the war ended on that date, fresh, motivated U.S. troops entered the fight and assured an Allied victory. As a result, President Woodrow Wilson played an oversized role in the fateful redrawing of borders across half the globe. Wilson was the primary proponent of American Exceptionalism, an idea promoted by the U.S. elite ever since. The myth that somehow America would always advance humanitarian interests attracted many, particularly the dispossessed, encouraged by Wilson’s “Fourteen Points.” The president took to his messianic mission with paternalistic passion but as the record shows, imperialism infected not only European powers, it also drove Wilson. Nonetheless, this outspoken advocate of some vague form of self-determination mesmerized literally millions. He was an empty vessel into which whole nations poured their hopes for a better life. For context, keep in mind that the horrors of WWI did not visit German soil nor did Germans see occupying troops except in the Rhineland. Few Germans knew that after the Allied advance of August 8, 1918, 16 German divisions disappeared within a few days and the remaining troops fell back miles at a time. They didn’t know that a week later General Ludendorff told the Kaiser to consider negotiating with the Allies and the next month demanded peace at any price. 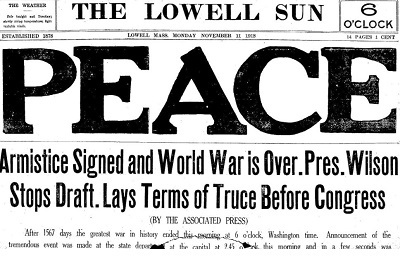 Few Germans regarded the armistice for what it basically was, a surrender. As a result, the Nazi’s myth of how the Kaiser’s High Command stabbed Germany in the back found ready listeners. MacMillan disputes that Germany’s reparations were overly burdensome. Here’s what the record shows. · France got back Alsace-Lorraine which it had lost in the Franco-Prussian War of 1871 (Prussia was one of several states that formed the nation of Germany in 1871 after that war). Allied troops occupied Germany’s Rhineland as a buffer for France. France also got ownership of Germany’s coal mines in the Saar which the League of Nations administered until a 1935 in which people voted overwhelmingly to rejoin Germany. · Czechoslovakia was given the Sudetenland, a region bordering Germany and Austria with 3,000,000 German-speaking people, as well as Austria’s Bohemia that contained another 3,000,000 German-speaking people. Hitler was to make the cause of these “lost Germans” his own and occupied the former Sudetenland after the Munich agreement in 1938. · Denmark regained, via plebiscite, two duchies previously seized by Prussia. · The reconstituted nation of Lithuania got the German port of Memel on the Baltic. · Germany turned over its entire naval fleet, airplanes, heavy guns and 25,000 machine guns. It was allowed an army of 100,000 and a navy of 15,000, but no air force, tanks, armored cars, heavy guns, dirigibles or submarines. Arms imports were forbidden, and only a few German factories were allowed to produce arms. As for money damages, with so much of Europe in chaos and ashes, it was difficult to determine how much Germany even owed. Initially, Britain wanted $120 billion, France $220 billion and the US $22 billion. They later submitted much smaller bills and the final calculation in 1921 ordered Germany to pay $34 billion in gold marks, apportioned 52% to France, 28% to Britain and the rest divided between Belgium, Italy and others. The U.S. had loaned Britain and France over $7 billion plus another $3.5 billion from U.S. banks. At Versailles, Britain proposed and the U.S. vetoed the idea of cancelling all inter-Allied debts. Between 1924 and 1931, Germany paid 36 billion marks to the Allies, 33 billion of which was borrowed from investors who bought German bonds issued by Wall Street firms. Germany then used that money to pay reparations to England and France, which in turn used it to repay U.S. loans. Anthony C. Sutton, writing in “Wall Street and the Rise of Hitler” observed, “The international bankers sat in heaven, under a rain of fees and commissions” made by lending other people’s money to Germany. As for personal culpability, Kaiser Wilhelm, grandson of Britain’s Queen Victoria, went into exile in Holland. Britain’s King George V, the kaiser’s cousin, eventually gave up the idea of a war crimes tribunal but sent Germany a list of several hundred he thought should be tried. Of that number, 12 were. Most were set free at once except for two submarine captains who escaped prison within weeks of being sentenced. One can hardly consider factors which led to Hitler’s rise without including a few examples of the highly influential complicity of U.S. corporations. · An open secret through the ’20’s was Henry Ford’s financial support for Hitler. A December 20, 1922 NY Times story claimed links between new uniforms and side arms for 1,000 young men in Hitler’s “Storming Battalion” and Ford’s portrait and books the Fuehrer prominently displayed in his well-staffed Munich office. (2) In 1938, Ford received the Grand Cross of the German Eagle award. · In February 1933, Hermann Goering held a fundraiser at his home for the National Trusteeship, a front group from which Rudolf Hess paid Nazi Party election campaign expenses. Industrialists and financiers pledged 3,000,000 marks including 400,000 from IG Farben and 60,000 from General Electric Corporation’s subsidiary, AEG. On the board of IG Farben’s U.S. subsidiary were Edsel Ford, Walter Teagle, board member of the NY Federal Reserve and Standard Oil of NJ and Carl Bosch, on the board of Ford’s German subsidiary, Ford AG. One week after that massive infusion of funds the Reichstag was burned. A week later, national elections swept the Nazis into power. Of the many subtexts of Versailles that grew to historic proportions was that Ho Chi Minh, working in Paris as a kitchen hand and a photographer’s assistant, appealed unsuccessfully to the American delegation on behalf of the people of Annam (Vietnam). Since the victory of the Allies, all the subjects are frantic with hope at prospect of an era of right and justice, which should begin for them by virtue of the formal and solemn engagements made before the whole world by the various powers of the entente in the struggle of civilisation against barbarism. The Annamite people, in presenting these claims, count on the worldwide justice of all the Powers, and rely in particular on the goodwill of the noble French people who hold our destiny in their hands and who, as France is a republic, have taken us under their protection. The ghosts of Versailles didn’t end with Vietnam. Versailles left in place the 1917 Balfour Declaration pledging Britain’s support to the Zionist movement’s interest in taking over Palestine for a Jewish homeland and the Sykes-Picot Agreement of 1916 giving Syria to France and Mesopotamia to Britain (which already had negotiated contracts with Arab leaders to control oil resources). For nearly two months commission members crisscrossed what is now Syria, Jordan, Iraq, Palestine and Lebanon, meeting with all manner of people, official delegations and groups with petitions in what appears to be a very honest attempt to determine public opinion. Their recommendations are nothing short of revolutionary, based on what we’ve learned in the meantime. We recommend, in the fifth place, serious modification of the extreme Zionist program for Palestine of unlimited immigration of Jews, looking finally to making Palestine distinctly a Jewish State. (1) The Commissioners began their study of Zionism with minds predisposed in its favor, but the actual facts in Palestine, coupled with the force of the general principles proclaimed by the Allies and accepted by the Syrians have driven them to the recommendation here made. (2) The commission was abundantly supplied with literature on the Zionist program by the Zionist Commission to Palestine; heard in conferences much concerning the Zionist colonies and their claims; and personally saw something of what had been accomplished. They found much to approve in the aspirations and plans of the Zionists, and had warm appreciation for the devotion of many of the colonists, and for their success, by modern methods, in overcoming great natural obstacles. (3) The Commission recognized also that definite encouragement had been given to the Zionists by the Allies in Mr. Balfour's often quoted statement, in its approval by other representatives of the Allies. 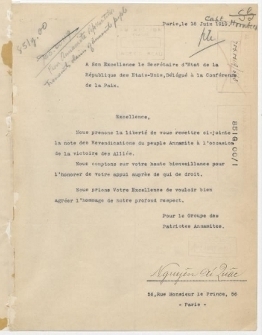 If, however, the strict terms of the Balfour Statement are adhered to — favoring "the establishment in Palestine of a national home for the Jewish people," "it being clearly understood that nothing shall be done which may prejudice the civil and religious rights existing in non-Jewish communities in Palestine"— it can hardly be doubted that the extreme Zionist Program must be greatly modified. For "a national home for the Jewish people" is not equivalent to making Palestine into a Jewish State; nor can the erection of such a Jewish State be accomplished without the gravest trespass upon the "civil and religious rights of existing non-Jewish communities in Palestine." The fact came out repeatedly in the Commission's conference with Jewish representatives that the Zionists looked forward to a practically complete dispossession of the present non-Jewish inhabitants of Palestine, by various forms of purchase. In his address of July 4, 1918, President Wilson laid down the following principle as one of the four great "ends for which the associated peoples of the world were fighting"; "The settlement of every question, whether of territory, of sovereignty, of economic arrangement, or of political relationship upon the basis of the free acceptance of that settlement by the people immediately concerned, and not upon the basis of the material interest or advantage of any other nation or people which may desire a different settlement for the sake of its own exterior influence or mastery." If that principle is to rule, and so the wishes of Palestine's population are to be decisive as to what is to be done with Palestine, then it is to be remembered that the non-Jewish population of Palestine---nearly nine-tenths of the whole—are emphatically against the entire Zionist program. The tables show that there was no one thing upon which the population of Palestine were more agreed than upon this. To subject a people so minded to unlimited Jewish immigration, and to steady financial and social pressure to surrender the land, would be a gross violation of the principle just quoted, and of the people's rights, though it kept within the forms of law. It is to be noted also that the feeling against the Zionist program is not confined to Palestine, but shared very generally by the people throughout Syria, as our conferences clearly showed. More than 72 per cent—1,350 in all—of all the petitions in the whole of Syria were directed against the Zionist program. Only two requests—those for a united Syria and for independence—had a larger support. The Peace Conference should not shut its eyes to the fact that the anti-Zionist feeling in Palestine and Syria is intense and not lightly to be flouted. No British officer, consulted by the Commissioners, believed that the Zionist program could be carried out except by force of arms. The officers generally thought that a force of not less than 50,000 soldiers would be required even to initiate the program. That of itself is evidence of a strong sense of the injustice of the Zionist program, on the part of the non-Jewish populations of Palestine and Syria. Decisions, requiring armies to carry out, are sometimes necessary, but they are surely not gratuitously to be taken in the interests of a serious injustice. For the initial claim, often submitted by Zionist representatives, that they have a "right" to Palestine, based on an occupation of 2,000 years ago, can hardly be seriously considered. What more can be said about the Treaty of Versailles except to ask: what are we doing today that will haunt the world 100 years from now?